The concept of doing an EOL/MeTAV album isn’t hard to put together, but I’m stoked for the class experience and the deadlines – I think I signed up for the MeTAV class the first day. (I tried back a year or so ago to follow along with some people who were making EOL albums on Digishoptalk, but never got much past making a list of words.) This form of organizing your memories and telling your stories is so deeply appealing to me, I’m very excited to actually get it into album form. In my mind, the MeTAV album will be a kind of snapshot of my current life, at just-about-to-be-30. I’ll probably do it again, part two, in another ten years or so. (And I wish I could find a place I could make a proper bound book of my 8.5×11″ pages – portrait, not landscape. What’s the deal, Shutterfly? and just about every other place I’ve checked. Why can we have 11×8.5 but not vice versa??) I do plan to do all the pages digital – Cathy is providing templates, and I found the perfect kit for me to use (Refreshing it’s called). My album is an 8.5×11 binder, an American Crafts corduroy binder, actually, much like the MeTAV class one, though green. I plan to include both digi pages, and paper pages (scanning tons of photos actually makes me want to do some paper scrapping; must be because I feel safe that there’s a back-up digital copy of the pictures). I’ve decided, rather than fret about using the exact same papers, or worrying about trying to get the paper and digi match, I will simply make each page/entry separate, but each more or less monochromatic, with plenty of white and kraft paper thrown into the mix. The section pages and the title and last page (made in paper; the images on this page are the sample ones I made to help me figure out which color should go where – but see, a rainbow of colors plus kraft and white as neutrals) should help tie it all together. I’ll file things alphabetically, but only by first letter, not worry much about true alphabetization. The focus will definitely be on the words, more than the photos, but I’ll probably use 2 or so photos per layout/entry (or stickers/elements occasionally for photo-less entries), and I’ll frequently use similar page layouts, even though the colors and paper will change. I also plan to throw in a few sheets of baseball card page protectors; they hold ATC sized cards and some of the smaller memories I’ll write on cards, decorate, and insert in those. Sorry, no real examples to show you yet, other than this title and section page. I’ll link to it when I’ve finished some – right now I’ve been collecting words, memories, and starting to type out some of the entries. I will probably have to do an entirely separate album for “family dialect” though. I love this format so much. It helps me focus on the stories, which to me, are the absolute best part. I really like this idea here of making a gratitude book and writing a page a year. I think I may poke around among my albums and see if I have one that would work. So I’m just about ready to start making my son’s baby book. My daughter’s is done, all except a bit of journaling, the last page, and that @#$&^*! ultrasound page, if I can ever find those darn pictures… (I had them, then lost them, then found them again, and now they’re lost again. I’m hoping it will come around again soon so I can put them in her book.) 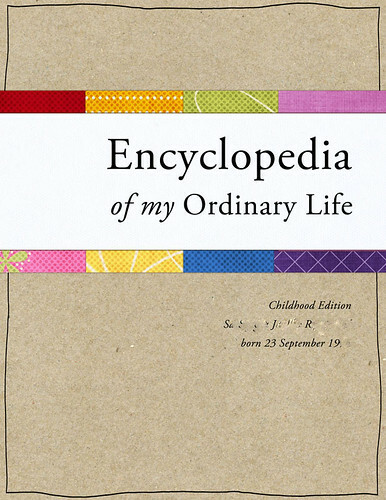 But anyway, it’s done – an 8×8 book of the highlights of her first year: milestones, firsts, all that sort of thing. (Still must scan all the pages.) And now I need to make one for my boy. Digital of course. Just about everything I do is digital lately. But I am going to get the pages printed separately and put them into a regular album (as opposed to getting it done as a hardbound book, which I thought about) – mostly because I want to use some of the same, special page protectors that I used in my daughter’s, one that opens like a door for the title page, and a couple that open opposite each other to make a four page spread – for the “see how you grow” type layout, with photos each month from newborn to one year. Also so I can include some memorabilia – first haircut, hospital bracelet, etc. Love this one, red, blue, green, orange, stars. This one has cool cars – but I mostly want it for that polka dot paper – looks almost just like the album I have. This is just cute – love the puppy. And the snail! Dotted paper is perfect, just needs red. Sigh. Why can’t I just find the perfect kit somewhere?? What I should really do is just look through all my stuff and make my own kit from things I already have. Hmph. Still thinking… but I want to get started soon. Until December 7th (and maybe a while after? 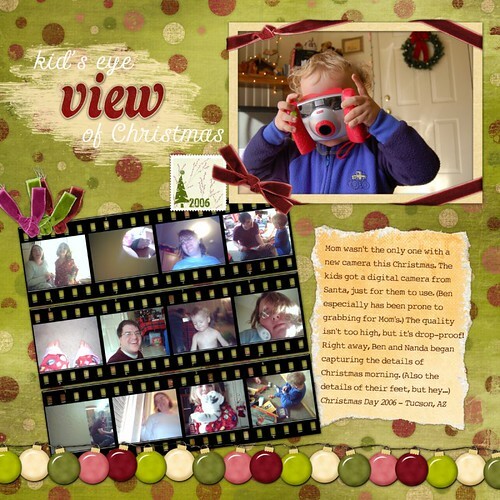 ), there is an amazing huge digital Christmas mega kit for free at Amy W.’s site. (Well, you can find the links from there.) The kit is called “One Night in Bethlehem.” My personal favorite portion of it (well, so far, I haven’t even gotten to all the links yet) is the nativity set here at JanniScrap Designs. 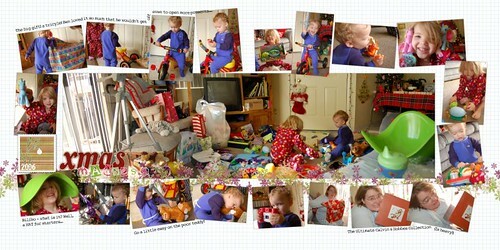 ETA: Okay, here’s a couple of Christmas 06 layouts I’ve done with the Noel kit, just to show some of it off. (Those stamps are in the kit, but actually have 2007 on them; I had to alter them after I realized that last year’s Christmas was, duh, 2006.) Do go check out the full kit, it’s beautiful, and benefits the Make-a-Wish Foundation. Two pagers are kind of a pain digitally. (For multiple reasons, not least the enormous file size. This one, as a .psd in layers, is 167MB, urgh.) Ah well. I wanted to this panorama photo of the chaos. As in paper scrapbooking, people wonder about how to keep all those luscious digital supplies in order. Some people talk about copying all their papers into one file, so as to have all their papers together, and so on. The very thought makes me cringe – first of all, I have SO MANY FILES. And how do you look at them all? Or figure out where you got them from? Do you keep multiple copies of the same item? If so, you’ll probably have space issues all too soon. What about keeping kits together so that you can take advantage of the nice coordinated products and all? First I download a freebie or bought item, then I move it from my desktop to the appropriate folder. I have a folder on my external hard drive called digiscrap supplies, and within that folder various others, named after the places that I get my supplies (occasionally after the designer herself); so for example, DesignerDigital, OScraps, Shabby Princess, Katie the SBLady, Scrap Artist, 2peas and so on. (Freebies always go in the main folder; if I paid for it, it goes in a “paid” folder within the location folder. I like to keep my paid stuff somewhat separate.) I put the zip file into the designated folder, and then unzip it. After I’m done unzipping my files, I move the zip files to their own folder: “unzipped” and “unzipped paid.” Less clutter. I don’t move any of the actual files or anything (except if there’s an .abr brush file, or a pattern file, I do copy that and put it in a folder I have specified for my PSE brushes – but I leave the original in the folder, just as it unzipped). I usually unzip things one kit at a time, unless I have lots of small individual freebies that don’t go with anything in particular. Next I go to my PSE Organizer. Under normal circumstances, it automatically detects that there are new files and asks if I want to import them, so I just click yes. Every now and then for some reason it doesn’t do this, and I have to choose Get Files from Files and Folders and do it manually — it’s not too bad though, because there is a box to check for “get files from subfolders” so it’ll grab them all at once rather than making me go back and do it again and again from each folder. So it pulls up thumbnails of the files – tip! press Ctrl-A instead of going through and checking each individual box. I won’t tell you how long it took me to figure that out. Ahem. It then imports them, and right away I begin filing them. I first put them in a collection. My collections are named by designer/shop, and then kits or categories within that. So for example, Shabby Princess collection group, and under that collections with the names of the kits: Festival, Two Soon, etc. I sometimes have a collection called “LDD freebies” and “LDD paid other” for things that I want in a collection, but that aren’t part of a large kit. Here at the left is a screen shot of my Collections bar, so you can see some of the different categories that I mean. My general rule for this (as with most of my scrapbook organizing) is: where would I look for it? How would I find it? In digi, I tend to want my kits together, so that I can easily look through them and use them for whole albums — also so that I can scan through them for color schemes and so on. However, sometimes I want to break out of the kit mentality, and try matching up things myself, or I want to find a particular item – a ribbon, or brad, or photo corner or something. That’s where the tag part of the system comes in. I also have a subcategory for color tags – ROYGBIV – but I’m way behind on tagging things with those. In a way it’s sort of silly to have them, since you can recolor things so easily, but oh well. And finally I also have a tag called Paid Good Money, so that I remember to use the ones I actually paid for as often as possible. It’s nice that I can choose to exclude the entire Scrap Digi category when I want to see how many photos I have, not counting all the digi supplies (which easily add several thousand files to my PSE catalog). I use the Stack Photos feature to group alphabets together – it makes them more manageable when I’m looking through the Organizer normally, not having to scroll through 26 (well, more with numbers) individual letter files all the time — when you pull up the collection the alphabet is in they will be visible unstacked (and you can always do that manually in the regular part of the organizer, too). So that’s my system for digi supplies. This way I always know where I got something (for the purpose of crediting, etc.) and can also just look for supplies by coordinated kit, or simply by what it is (let’s see, I really need a flower here…). It’s been working great so far. One more note: when I’m doing a coordinated album (like the birthday one I did for my dad – hm, I should post that – or the family reunion one I’m in the midst of, or the baby album I need to do for my boy) I decide which kit (and extra items) I want to stick with for it, then I either make an additional tag (“Family Reunion Album”) or collection, and apply it to all those files, as well as the photos I want to include. It’s like my “supply bag,” keeping all the supplies for that project together, and then when I’m working on it I just click that tag (or collection) and it pulls up everything I need for it, and from there I choose my photos and supplies for any given page and just open them into the Editor. Then later I delete the temporary tag or collection and it is removed from all those photos and files. At least, as far as the Organizer goes it does. However, I recently read that while PSE applies tags to the files, right in the metadata, it does not actually remove them from the metadata when you delete the tag, or remove it from a photo. So I think I’ll probably start using a collection instead of a tag for this “supply bag” purpose. One other reason to do this – when I click on a tag it takes a while to sort through and load just those photos; loading a collection is much faster. So there you are. I’m sure you could institute a similar system with any program that lets you use tags and so on – Picasa, ACDSee (I think), or others. I just hope that someday in the distant future when I actually get real live Photoshop, that it plays nicely with the PSE Organizer. Because I would be lost without this thing. Geez louise, I gotta post earlier in the day. 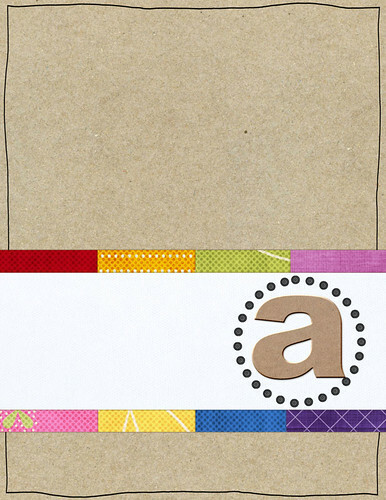 The talented Smocklady sent me a question about digital scrapbooking. So here we go, I’ll share a few tips, and reasons why I am so into digiscrapping right now. Tip 2: Drop shadows are extremely important, especially if you’re like me and you like to make your pages look similar to paper in many respects. When I found this tutorial that showed me how to adjust my drop shadow from PSE’s ridiculously huge default of 21 pixels, to something far more realistic, like oh, say, 2 or 3 for flat paper, it made a huge HUGE difference. I listed some other tips in this former entry. The ease of resizing photos, or converting to black and white if I so desire, and not having to get them developed first. I’m way behind in my printing schedule, and so most of the ones I just have hanging around are older pics. That’s fine, but sometimes I want to do something more recent, and I have improved SO much in my photography, that normally if I want to just make something pretty, with a nice photo? That means using a much more recent picture. I love being able to match colors to things in my photos, or in a piece of digital paper I’m using. Not to mention being able to use the Hue/Saturation sliders to change the color of my digital supplies if I want to. So little mess. Easy to save and put away for the moment (well, in theory, if I didn’t have obsessive tendencies). And so easy to take to crops. I love the socialization and dedicated time at crops, but I hate hate hate packing my paper supplies and tools, especially if I don’t have a current, very specific project going, where I’m using limited supplies and I have them all together. Even having to haul my whole desktop along, it is easier and faster and much less stressful for me than packing half the doggone room into crates and bags, that weigh a ton, “in case” I need something. Just imagine how easy it’ll be when I have a laptop and just have to plug it in and open it up… oh, did I just salivate on my keyboard? Whoops. The undo button. Brushes. Making templates (I find this really fun, for some reason). Being able to type out a nice long piece of journaling without futzing with my printer and all. How easy it is to recreate the simple style of paper layout that I like so much — like many Cathy Zielske and Becky Higgins layouts, for example. All the beautiful free supplies. Also lovely ones to buy, most relatively inexpensive (especially considering that you can reuse them as much as you want). But honestly, so much awesome free stuff. You could go for so long (possibly forever) on just the free stuff. And regardless, you can get it all from your computer RIGHT AWAY, as soon as you download it. Woohoo! And finally, for your downloading pleasure, these are my current favorite places for digital scrapbook supplies. Oscraps.com – Has some fabulous freebies, and lots of variety. ShabbyPrincess and her Shabby Shoppe – Shabby Princess has the most beautiful free kits, just gorgeous. Scrap Artist has beautiful stuff. I also like Little Dreamer Designs. Both of these sites offer freebies as well, and LDD has regular freebies on their blog. Digi Shop Talk has a very good deal of $25 for a year’s worth of kits, one per month. I like what I’ve seen of their message boards. P.S. Costco does 8×8 and 12×12 prints now. Can’t wait to try them. This is not a brand new revelation, but here’s a totally awesome idea. I love the binder, and the idea of keeping all the different size layouts together. Here's my post on the topic.